Front: Postcard photograph of 11 football players on 1904 team in uniform with a football. 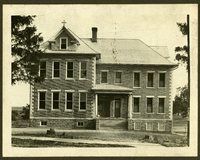 Postcard of Snake Hollow School building with man in car in front. Photograph of about 100 elementary students and teachers on steps in front of brick building. School photograph of 21 boys and 10 girls with teacher on steps in front of brick building. 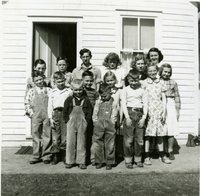 Front: Photograph of six girls and three boys and a teacher in front of school. Back: List of names of children and teacher on front. Front: Class photograph of 15 children ad teacher in front of elementary school. 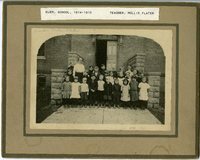 Photograph of about 30 children and teacher on steps of brick building. Postcard photograph of 19 elementary school boys with flags on steps in front of brick building.